Buy Viton® o-rings quick and easy from the world’s largest Viton® o-ring inventory network. Viton® o-rings offer excellent chemical and temperature resistance and are available in a wide variety of FKM types and formulations. Standard AS568 imperial, metric and non-standard Viton® o-ring sizes are kept in stock, and custom Viton® o-rings are typically available with no tooling fees and rush deliviers. Specialty FPM and FKM compounds are available for improved low temperature and chemical resistance. Viton® specialty formulations are also available for durometer hardness, colors, food and medical grade, high pressure, and explosive decompression resistance. Viton® fluorocarbon compounds are widely used in chemical, aerospace and industrial applications, but are not recommended for use with steam, amines, or polar solvents. Viton® O-Ring and seal performance cost benefit makes it the second most popular sealing material. 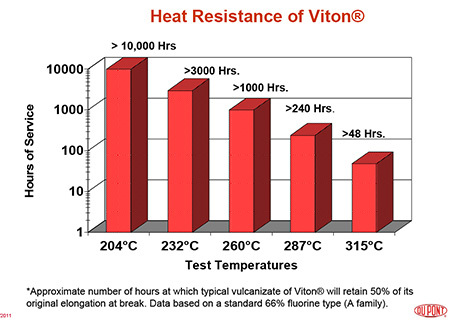 Fluoroelastomer (Viton®, FKM) offers a wide range of resistance to chemicals, oil and heat, with situational service life above 200°C. 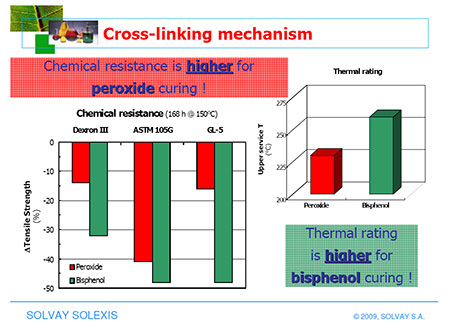 The outstanding heat stability and excellent resistances are due to the high ratio of fluorine to hydrogen, the strength of the carbon-fluorine bond, and the absence of unsaturation. FKM compounds are widely used in chemical, automotive, aerospace and industrial applications. Fluoroelastomers are referred to generically as FKM polymers per the nomenclature noted in ASTM D1418. In the SAE J200 ASTM D2000 classification system for rubber materials Fluoroelastomers are documented as a “HK”. FKM, FPM (Europe), Fluoropolymer, Fluoroelastomer. Trade Names: Viton®, Fluorel®, Technoflon®, Dai-El®. Specialty Performance Polymer Types: A, B, F, GLT, GFLT, XLT, ULT, ETP, TBR. Ketones (MEK,and Acetone) and Skydrol fluids. Low molecular weight esters and ethers. Hot hydrofluoric or chlorosulfonic acids and low molecular weight organic acids (formic and acetic acids).